The Predator, ready to, uh, predate. 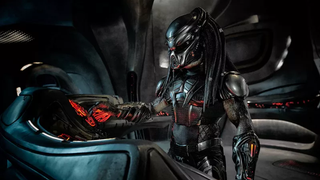 The Predator, Shane Black’s wild, manic reboot of the Predator franchise, was not a good movie. But recently revealed concept art suggests it could have been a masterpiece. Oh, how the best ideas never come true. That’s right, there were nearly Predator monkeys. Earlier drafts of the film apparently had a healthy focus on so-called “Menagerie” of hybrid creatures, though they’re largely absent from the final cut (except for the dogs!) for reasons that are tragic and likely lost to time. Look, I’m not saying the problems with the script, direction, and Shane Black’s questionable decision making would have suddenly disappeared if this movie had Predator monkeys in it. But I am saying that the Planet of the Apes crossover would have been incredible.